Meet Parrish Brown Hoag! Parrish is the featured artist at the 2018 Marketplace and is a lifelong Gainesville resident.She earned her degree in Business Administration at Georgia Tech, which is where she met her husband, Chris, during their freshman year. 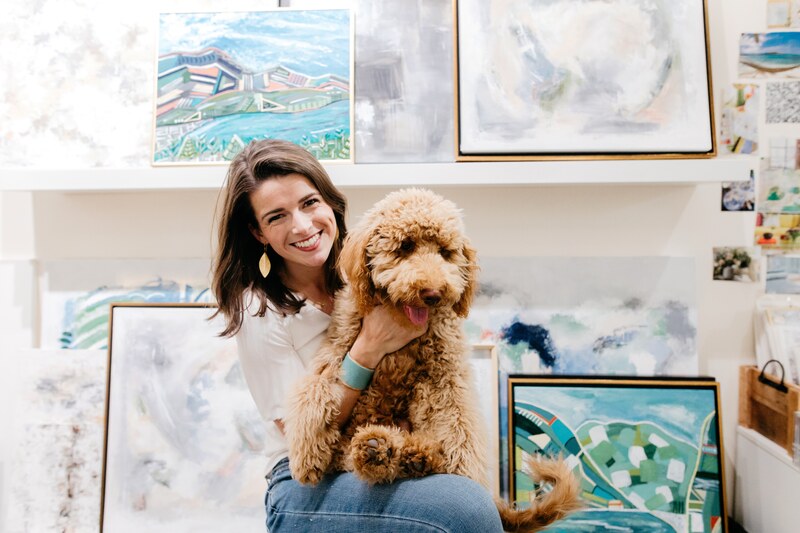 Her and her husband now enjoy living in Atlanta especially with their golden doodle puppy, Berkeley. The 27th annual Marketplace is sponsored by the Medical Center Auxiliary and will be Nov. 1-3 at the Gainesville Civic Center. The annual holiday shopping event is led by Volunteer Tri-Chairs Katie Crumley, Morgan Wood, Jenny Floyd. One hundred percent of proceeds will benefit Safe Kids Gainesville/Hall County, led by Northeast Georgia Medical Center. You will have a chance to shop Parrish’s artwork at the three day event. We want to thank Parrish for taking time with us recently for spending time with us and telling us more about her life and love of Hall County.